For a list of presentations, please go to the presentations page. Rose, H., McKinley, J. & Briggs Baffoe-Djan, J. (2019). Data Collection Research Methods in Applied Linguistics. London: Bloomsbury. The successful collection of data is a key challenge to obtaining reliable and valid results in applied linguistics research. Data Collection Research Methods in Applied Linguistics investigates how research is conducted in the field, encompassing the challenges applied linguists face in collecting good data. Each chapter focuses on one type of data collection, outlining key concepts, threats to reliability and validity, procedures for good data collection, and implications for researchers. ​Rose, H. & Galloway, N. (2019). Global Englishes for Language Teaching. Cambridge: Cambridge University Press. The spread of English as a global language has resulted in the emergence of a number of related fields of research within applied linguistics, including English as an International Language, English as a Lingua Franca, and World Englishes. Here, Heath Rose and Nicola Galloway consolidate this work by exploring how the global spread of English has impacted TESOL, uniting similar movements in second language acquisition, such as translanguaging and the multilingual turn. Rose, H. & McKinley, J. (Eds.). (2017). Doing Research in Applied Linguistics. Abingdon: Routledge. 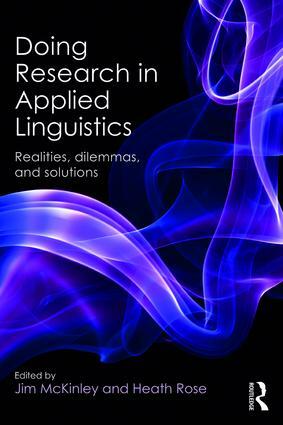 Doing Research in Applied Linguistics: Realities, dilemmas, and solutions provides insight and guidance for those undertaking research, and shows the reader how to deal with the challenges of this research involving real people in real settings. Rose, H. (2017). The Japanese Writing System: Challenges, Strategies and Self-regulation for Learning Kanji. Bristol: Multilingual Matters. This is the first book devoted to exploring issues of learning written Japanese, focusing on the challenges the writing system poses for the second language learner. It weaves together previous research on Japanese second language acquisition and kanji learning with original studies on self-regulation and kanjilearning strategies. It helps further our understanding of second language writing acquisition and offers new directions for research in the wider fields of language learning strategies, motivation and self-regulation. Galloway, N. & Rose, H. (2015). Introducing Global Englishes. Abingdon: Routledge. Carson, L. & Rose, H. (Eds.). (2014). Focus on East Asia: Language Learning and Teaching. Special Issue of Language Learning in Higher Education 4 (2). Rose, H. (Ed.). (2012). Strategies and Self-Regulation in Self-Access Learning. Special Issue of Studies in Self-Access Learning Journal, 3(4). Rose, H., Curle, S., Aizawa, I., & Thompson, G. (advanced online access). What drives success in English medium taught courses? The interplay between language proficiency, academic skills, and motivation. Studies in Higher Education. Thomas, N., Rose, H.& Pojanapunya, P. (2019). Conceptual issues in strategy research: Examining the roles of teachers and students in formal education settings. Applied Linguistics Review. Aizawa I, & Rose, H (advanced online access). An analysis of Japan's English as medium of instruction initiatives within higher education: the gap between meso-level policy and micro-level practice. Higher Education. ​Thomas, N & Rose, H (2018). Do Language Learning Strategies Need to Be Self-Directed? Disentangling Strategies From Self-Regulated Learning, TESOL Quarterly. 53(1): 248-257. McKinley, J & Rose, H (2018). Conceptualizations of language errors, standards, norms and nativeness in English for research publication purposes: An analysis of journal submission guidelines, Journal of Second Language Writing. 42: 1-11. Rose, H. & Montakantiwong, A. (2018). A Tale of Two Teachers: A Duoethnography of the Realistic and Idealistic Successes and Failures of Teaching English as An International Language. RELC Journal 49(1): 88-101. Rose, H. & Conama, J. B. (2018). Linguistic imperialism: still a valid construct in relation to language policy for Irish Sign Language. Language Policy 17(3): 385–404. Galloway, N. & Rose, H. (2018). Incorporating Global Englishes into the ELT classroom. ELT Journal, 72(1): 3–14. .
Rose, H., & McKinley, J. (2018). Japan’s English-medium instruction initiatives and the globalization of higher education. Higher Education, 73(1): 111–129. Syrbe, M. & Rose, H. (2018). An evaluation of the global orientation of English textbooks in Germany. Innovation in Language Learning and Teaching, 12(2): 152-163. Rose, H. & McKinley, J. (2017). The prevalence of pedagogy-related research in applied linguistics: extending the debate. Applied Linguistics, 38(4): 599–604. Rose, H. & Galloway, N. (2017). Debating standard language ideology in the classroom: using the ‘Speak Good English Movement’ to raise awareness of Global Englishes. RELC Journal, 48(3): 294 - 30. Rose, H. & Harbon, L. (2013). Self-regulation of the kanji-learning task. Foreign Language Annals, 46(1): 96–107. Galloway, N. & Rose, H (2013). They envision going to New York, not Jakarta: The differing attitudes toward ELF of students, teaching assistants, and instructors in an English-medium business program in Japan. Journal of English as a Lingua Franca, 2(2). Rose, H. (2012). Editorial: Learner Strategies, Self-Regulation, and Self-Access Learning. Studies in Self-Access Learning Journal, 3(4). Rose, H (2012). Reconceptualizing strategic learning: Throwing language-learning strategies out with the bathwater. Applied Linguistics, 33(1). Rose (2012). Language Learning Strategy Research: Where do we go from here? Studies in Self-Access Learning Journal, 3(2). Rose, H. & Elliott, R. (2010). Using the curriculum to encourage student use of a self-access conversation area. Studies in Self-Access Learning Journal, 1(1). Laskar, B. & Rose, H. (2008). Instituting a system of competency based assessment in a learner-centered curriculum. Studies in Linguistics and Language Teaching. 18: 157-175. Rose, H. (2007). Jump-starting student motivation to use self-access learning facilities in high-anxiety learning environments. Kanda Journal. 19: 171-188. Laskar, B. and Rose, H. (2006). Basic English Proficiency Project Research Report. Studies in Linguistics and Language Teaching. 17: 195-203. Rose, H. (2003). Teaching learning strategies for learner success. 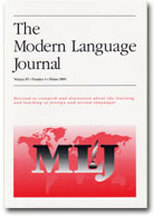 BABEL: Journal of Modern Language Teaching Association Australia 38(2): 32-38. ​Rose, H. (2018). ‘Popular Approaches to EAL Instruction’, In TESOL Encyclopedia of English Language Teaching (Teaching English as an International Language). Hoboken: Wiley. Rose, H. & Syrbe, M. (2018). ‘Assessment Practices in Teaching English as an International Language’, In TESOL Encyclopedia of English Language Teaching (Teaching English as an International Language). Hoboken: Wiley. Rose, H. (2017). ‘A global approach to English language teaching: Integrating an international perspective into a teaching methods course’, In Matsuda, A. (ed.) Preparing Teachers to Teach English as an International Language (pp. 171-183). Bristol: Multilingual Matters. Rose, H. (2017). 'Responding to theoretical shifts in research design', In McKinley, J & Rose, H. (eds.) Doing Research in Applied Linguistics. Abingdon, UK: Routledge. Rose, H. & McKinley, J. (2017). 'The realities of doing research in applied linguistics', In McKinley, J & Rose, H. (eds.) Doing Research in Applied Linguistics. Abingdon, UK: Routledge. Rose H. (2015). 'Researching language learner strategies', In Paltridge, B. & Phakiti, A. (eds.) 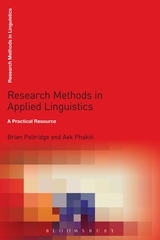 Research Methods in Applied Linguistics. New York: Bloomsbury. Rose, H. (2010). Kanji learning: Strategies, Motivation control and self-regulation. Doctoral Dissertation. The University of Sydney. Rose, H. (2009). EAP 1: Forging collaborative learning in a student-centered curriculum. In College of Business BBL (Ed.) Annual Report. Rikkyo University, Japan. Rose, H. (2008). ESP. In College of Business BBL (Ed.) Integrating English Education and Business Studies: Rikkyo COB’s Challenge. Rikkyo University, Japan. Rose H. (Ed.) Research papers in task-based language teaching: Issues in curriculum design and development. Basic English Proficiency Project, Kanda University, Japan. Kosaka, T. & Rose, H. (2010). Business all-in-one. Japan Times Publishing, Tokyo, Japan. Kosaka, T. & Rose, H. (2010). Eigonosanjubyosupiich. Kenkyusha Publishing, Tokyo, Japan.